Because Claire’s (Jennifer Aniston) life is no cakewalk. There’s no icing on. Or piece of. Cake refers to a late-in-the-movie situation wherein a young hitchhiking actress-wannabe bakes Claire a cake upon request and then steals her car. Now you understand the title, right? It makes perfect sense now. But we’re getting ahead of ourselves. Claire’s a wealthy L.A. lawyer who got smashed up in a car accident that killed her child and left her physically and emotionally scarred, in chronic pain, and so bitter that she gets booted from her grief support group. Group counselor (Felicity Huffman) asks said group to express their feelings concerning Nina (Anna Kendrick), a member who committed suicide. To the group’s collective mortification, Claire recounts the tale of the suicide trail: jumped off overpass, landed on flatbed truck, ended up in Mexico before anyone discovered the body … sent back in a Rubbermaid … “Way to go Nina!” Claire stops short of sarcastically holding up a judge’s scorecard. “We think you’d be better served elsewhere,” comes the voicemail when Claire gets home. If Nurse Jackie overdosed on Percocet and reincarnated as a lawyer—that’s Claire. Shortly after leaving said support group, she sweet-talks her new counselor into additional (illegal) supplies of OxyContin (which she washes down with wine). She has her maid, Silvana (Adriana Barraza), drive her to Mexico for some more (illegal) meds. The pharmacist queries as to whether she’s trying to sedate a small city. If Nurse Jackie overdosed on Percocet and reincarnated as a lawyer—that’s Claire. Speaking of pools, she attends pool physical rehab. She’s abusive to the therapist (Mamie Gummer, Meryl Streep’s daughter), who wants to assess why there’s been no improvement in six months. Nina keeps showing up in Claire’s dreams and what appear to be either visions or drug hallucinations, in what seem to be projections of Claire’s own cynicism. Is Claire’s refusal to take her various forms of therapy seriously, choosing instead to isolate and medicate—is that all leading to her own overpass jump or drug overdose? Claire stalks Nina’s husband, Roy (Sam Worthington), for possible answers. Will he and Claire hit it off? Will Claire go lie on some train tracks and let Union Pacific put her out of her misery? At some point you notice the score consists of sitcom stylings and Philip Glass-type riffs, but it all serves to subconsciously underscore the comedy chops that will always seep through Jennifer Aniston’s work, whether she’s suffering chronic pain or not. 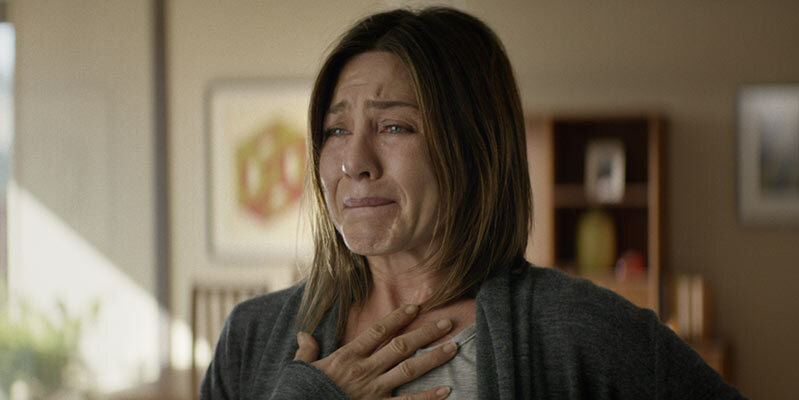 But Aniston is clearly making a bid to be taken more seriously with this painful to watch, understated wince-fest. And with the timing of this film—it’s clearly an Oscar bid. And it’s got Oscar-capable actors. Barraza’s performance especially stands out. Aniston’s performance is of course the point of the whole thing, and while it’s not really a tour de force, and while plenty of other actresses could just as easily knock it out of the park, the fact that it’s such a seldom departure from Aniston’s long-established comedic power alley makes it the main thing worth watching here. Too bad the script is so terribly uninspired. And so the obviousness of the Oscar-bid timing reduces the effectiveness of Aniston’s performance rather a lot. It manufactures high expectations. It’s a tiny indie movie-let, not her big, departure-into-dramatic-acting moment. Yet. It may still happen for her. The film’s best scenes focus on Claire and Silvana’s relationship, with the road trip to Mexico being the best of all. The rapport and repartee between these two could have been the whole film, a la “Thelma & Louise.” Those two were dealing with pain and headed to Mexico too. It should have been a routine, but highly profitable salvage job.